Several years ago, professor of religion Vicki Brennan began discussing with then UVM Marsh-Professor-at-Large J. Lorand Matory ways to interpret the Yoruba religion for a region largely unfamiliar with African spirituality. What if there could be a public display of sacred objects? What if the exhibit, say in a museum, could include other faiths that emerged from sacred practices of enslaved Africans, like Haitian Vodou and Cuban Santeria? And what if students could be involved in creating the exhibition? Their conversations served as the seed for “Spirited Things,” a public exhibition which was on display at UVM’s Fleming Museum September 26-December 15, 2017. The project took several semesters to develop, and students were involved in the process the whole way. 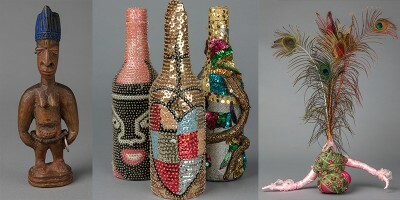 The core of “Sacred Things” consisted of objects drawn from the Sacred Arts of the Black Atlantic Collection (SABA) at Duke University, the product of years of ethnographic research by Matory. A professor of cultural anthropology at Duke and director of the SABA Project, Matory held several residencies over a six-year period at UVM and helped move the project forward. The exhibition was anchored by four “altars” designed to be interactive, with prayer mats for worship and musical instruments to play. In staging the exhibition, the curators sought to counteract the historical use of the word "fetish," which was often used by Westerners to describe these objects. The term tends to dismiss African religious practices as barbaric—“Spirited Things” focused on how belief and ritual can animate objects in ways that express nuanced relationships among members of a society, and between the people and their gods. Students in Brennan’s “Afro Atlantic Sacred Arts” seminar pored through the collection’s online catalog to choose objects. They presented proposals to Matory and professional museum staff, with ideas on how to convey the complex diaspora of Western African religious traditions for a general audience. “In order to convey the exhibition themes, the students really needed to develop a deep understanding of the objects exhibited in religious, historic and aesthetic terms,” said Brennan. During the following semester another class developed interpretive materials, handouts and gallery guides that local educators could use in their curricula. Students also lent their input to Fleming guides to help them interpret the experience for visitors. For Mackell, a small statue of the Afro-Cuban goddess Yemayá, manufactured in China in 2014 and picked up by Matory in a Los Angeles botanica, served as the inspiration for independent research. Mackell gave a talk titled “Yemayá on Display: Post-Colonial Contact Zones in the Museum” at the "Black Sacred Space: Materiality and Representation” symposium, another outgrowth of the project. The April 2018 event organized by Brennan featured Dr. Yanique Hume of the University of the West Indies (a graduate of the UVM relgion department), and former UVM faculty member Dr. Todne Thomas of Harvard University, along with Professor Matory and Janie Cohen, the director of the Fleming Museum. The symposium gave undergraduates an opportunity to present along with their teacher-scholar colleagues. Here are students on the panel at the Symposium discussing their work on and reactions to the exhibition.